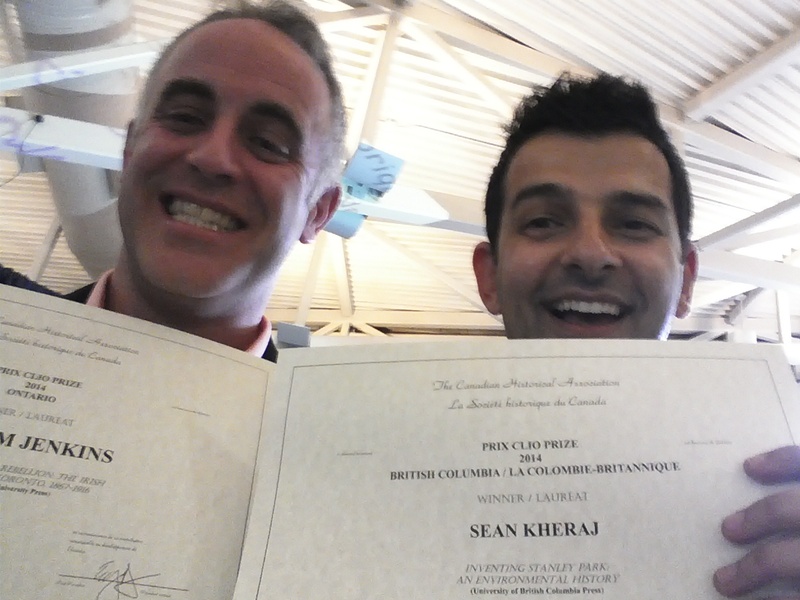 Jenkins and Kheraj celebrate dual Clio Prizes at CHA annual meeting at Brock University. I am very happy to share the news that Inventing Stanley Park won the 2014 Canadian Historical Association Clio Prize for outstanding contribution to British Columbia history. Obviously, this is a tremendous honour and I am grateful to the prize committee and the rest of my colleagues in the CHA. This was very exciting news. Inventing Stanley Park is not just an environmental history of one of Canada’s great urban parks. It is also a story about Canadians’ complicated relationship with “Nature”. On the one hand we like our nature “virgin” and “wild” but we also want it “tidy” and “handy”. Kheraj tells a story of a tongue of land that falls just short of closing the mouth of Burrard Inlet, controlling access to what became Vancouver Harbour and its extension,Indian Arm: a location so strategic that for thousands of years it was home to Coast Salish people and then with the arrival of immigrants was quickly declared a military reserve. Harvested by First Nations and then by sawmill loggers, its strategic military value preserved it from urbanization until invasion threats passed and this much-used landscape was declared a natural refuge. Kheraj documents the interaction of humans and the environment of the park area from its early habitation through the response of Vancouverites to a dramatic blow-down in the park in 2006 focussing on how ideas of park changed over time. His work draws on a rich, recent literature on parks in general and on Stanley Park in particular, but he moves beyond the accepted premise that nature is a human construction and argues that ecosystems are, in their unpredictability and force, a key part of the historical record. He sees the physical environment as an actor that deserves independent attention, and yet cannot be disentangled from human actions in the park. In Stanley Park, Kheraj provides a microcosm of the contentious issues one sees in the creation of larger national parks, including the eviction of Indigenous People and the suppression of subsistence uses, along with the issues of urban parks influenced by the “city beautiful” movement with its bourgeois aesthetic and class components. Drawing on a sophisticated literature this accessible, well-illustrated volume overturns some popular understandings of the park and invites us to see it as a site with multiple histories still being written. It captures the flavour of a quintessential British Columbia landscape and the ongoing debate over how to define and defend it. Using an innovative methodological approach which combines social historical methodology with historical geography, this book examines the lives and allegiances of Irish immigrants in Toronto and Buffalo in the period between the Fenian Raids and the 1916 Easter Uprising. Jenkins takes up the challenge of rendering the compelling allegiances of those communities intelligible through his examination of the transformations that took place over the politically-charged period of the narrative. The book is organized into two sections, both of which are grounded in a broad array of sources. In the first Jenkins examines the historical geography of the Irish immigrant experience in both Toronto and its American neighbor Buffalo, two rapidly growing cities that were both major destinations for Irish immigrants. In the second he provides an insightful analysis of the transformations and the ‘prevailing threads’ which run from the immigrants to their descendants. It is a work of remarkable complexity and it is firmly-rooted in the historical scholarship of both the Irish diaspora and Canadian and American politics. At one level, its insightful interpretations and its comparative structure add greatly to our understanding of a commonality of experience. More importantly, however, the subtlety and thoroughness of the argument and the skill of the author as a writer provide a richly nuanced study which accounts for national and transnational influences and for the power of geography as a vital historical determinant. Also, you can read a new review of the book in BC Forest Professional here. 2 out of 5 cones!